Lubricated clear latex condoms. This is the standard hat which lovers of all ages are most familiar. Molded on forms exactly fitted to Mr. Happy's personal dimensions and lovingly dipped into high quality hot clear liquid latex before adding an individual dollop of silky lubrication, these condoms are designed to give lovers the slippery smooth sensation they've come to associate with Mr. 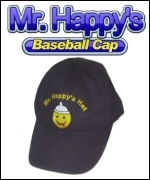 Happy's Hats. Mr. Happy says, IF YOU LOVE YOUR LOVER, YOU WILL LOVE THIS HAT!!! Shipping and handling is just $3.49 to US customers. Please email us for information about international shipping.